Back to Leda on the "Homefleet Ships starting with L" page. 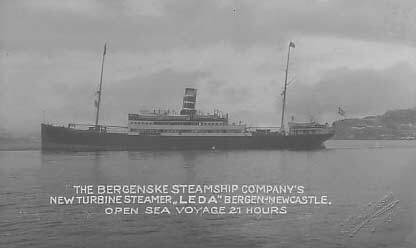 Delivered in Nov.-1920 from Sir W. G. Armstrong, Withworth & Co. Ltd., Walker-on-Tyne (965) as passenger vessel Leda to Det Bergenske Dampskibsselskab, Bergen. Steel hull, 305.6 x 41.7 x 18.4, 2519 gt, 1540 tdwt, 2 Brown-Curtis steam turbines (Wallsend Slipway & Eng. Co. Ltd., Wallsend, UK) geared to 1 propeller, 624nhp,16 knots. Used in Bergenske D/S's Bergen-Stavanger-Newcastle route together with the company's Jupiter, as well as Venus and Irma. (The latter was taken out of the route in Oct.-1921). Rebuilt in 1930, becoming 2415 gt. A new passenger vessel named Venus was delivered to the company in May-1931, replacing the old Venus in the route, and from then on Jupiter, Leda and the new Venus were used together in this run (the old Venus, meanwhile, was renamed Sylvia). Somewhat altered in 1936 (mostly interior alterations). In Jan.-1937 Leda saved the crew from the cargo vessel Karmt of Haugesund in a hurricane in the North Sea. In the same hurricane Jupiter saved the entire crew of the cargo vessel Weni from Stavanger, while Venus rescued the crew from Trym of Trondheim, and Lyra (Iceland route) saved the crew from the Swedish fishing vessel Nordland - all under dramatic circumstances. Jupiter and Leda were replaced in the route to England by the newly built passenger vessel Vega in May-1938. Leda was subsequently placed in weekly service Bergen-Hamburg. The outbreak of war in Sept.-1939 caused BDS to take the most valuable vessels out of the routes abroad, and instead used the less valuable ships, Leda being among the ships laid up in Norway. In the fall of 1939 she made some voyages carrying Norwegian soldiers from Oslofjorden to the north of Norway, together with Jupiter and Lyra. Laid up in Kirkebukten, Bergen in 1939 together with Jupiter, and was still there when Norway was invaded on Apr. 9-1940. Jupiter and Leda were moved to Eidsvågsbukten north of Bergen on Apr. 16-1940 and used as accommodation vessels for Norwegian prisoners of war. The tanker Tiger, which had been seized by the Germans and was laid up near Jupiter and Leda and used as floating fuel depot, was attacked by allied aircraft. A bomb was dropped very close to the 2 passenger vessels, though they were not directly hit, nor was Tiger. Leda was requisitioned by the Kriegsmarine on July 31-1940 and used as accommodation vessel in Bergen, also used in connection with the ferry traffic between Germany and Sweden, with German crew. From May 18-1944 she was in use as tender for an artillery school, location unknown, then from Dec. 28 that same year she was used as transport for Kriegsmarine Dienststelle Stettin. On March 25-1945 Leda was on a voyage from Stettin to Swinemünde when she was shelled and sunk by Russian artillery fire from the land batteries near Gross Siegendorf in the Oder outlet. 20 men died. She sank at a depth of 8 meters with her bow above water. The wreck was taken over by Nortraship in May-1945, but it took 2 years before Polish authorities gave permission to inspect the wreck. Raised in Dec.-1948 and taken to Szczecin, Poland (Stettin), condemned. Towed to Lübeck (arrived Jan. 26-1949) in the hope of getting her sold. By the fall of 1949 several bids had been received, but for no more than between N. Kr. 125 000 and 130 000, and she was eventually sold in Dec.-1949 to Eisen & Stahl AG, Bremerhaven, Germany for breaking up. (Roger W. Jordan says she was salvaged by the Soviet Union in 1949. Left Lübeck [where she had been taken for patching up] on Dec. 16-1949 for Bremerhaven, to be reconditioned, 1950). (Sources: "The World's Merchant Fleets", Roger W. Jordan [which gives tonnage as 2519 gt], "Hjemmeflåten - Mellom venn og fiende", Lauritz Pettersen (which gives the sinking date as Apr. 20*-1945, as does Roger Jordan's book), "Bergenske - Byen og selskapet", Dag Bakka jr., 1993, and info received from T. Eriksen, Norway - His sources: Articles about Bergenske D/S in "Skipet" 1-2.88 by Dag Bakka jr., "Norges eldste Linjerederi, BDS 1851-1951", Wilhelm Keilhau, "Båtene våre, -hvor ble de av", Dag Bakka jr. for Bergens Tidende 198x, "Lang Kyst", Trygve Nordanger 1975, "Full storm", Trygve Nordanger 1973). A fishing vessel, M/S Leda (H 1 MF) escaped from Masfjord on Sept. 1-1941 with 27 people on board, including 3 women, arriving Lerwick on Sept. 4.